You Don't Have To Be A Girly Girl To Rock Pink. It's a head to toe pink kind of summer. Even though I love the color, I love the look - its really just not me. I do consider myself a girly girl. I love jewelry, I love dresses, I love a lot of things, but I just don't wear a lot of pink. 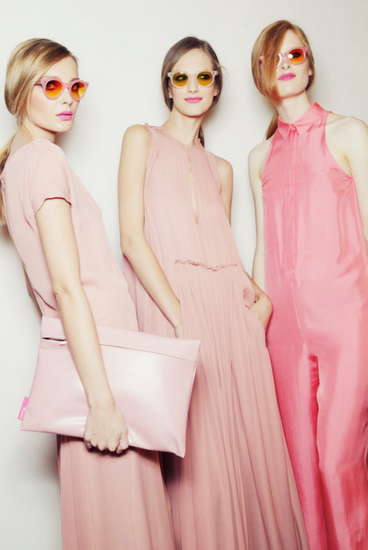 But this summer it looks like there's a head to toe pink summer bandwagon, will you be jumping on? If you're not all about the head to toe, how about just a pop of pink? I will probably be leaning towards the pop. A light pink blazer - I would probably live in this. Now that I think about it, I maybe wearing pink everyday. My recent purchase Smashbox's Electric Pink Matte lipstick hasn't left my purse since I bought it. It's pink enough to stand out, but it won't blind you. Will you be believing it this summer? Pink is my favorite color, so I loooove these!